What this country needs is more girls who grow up wrenching on beater hoonmobiles, girls who see the Radiator Hoes as their role models. Mattel feels that it's kinda OK for little girls to play with toy cars, as long as they're, you know, all girly about it. Thus, a new line of toys is born: Polly Wheels! 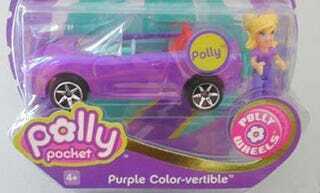 Essentially Matchbox cars merged with the Polly Pockets line of dolls, the whole deal is summed up by Mattel's name for the Polly Wheels track set: Race To The Mall! How about Nitrous-Assisted Donuts In The Mall Parking Lot instead, Mattel?